Finding the right keywords for your site to rank in search engines can seem overwhelming. Keyword research tools are in abundance, but how do you know which ones to use and how much to pay. In this article I show you how to do keyword research and specifically how to find low competition keywords for free. Why do we need keywords? Keywords are a word or phrase used to find content in a search engine. Keywords are used by search engines (such as Google, Yahoo and Bing) as a way to find out what your site is about. Ranking on the first page of search engine results (SERP) is important to drive traffic through to your site. Using keywords in specific places on your webpage (such as title, subheadings, image names) helps you to rank well and get traffic to your site. If you want to learn more about how to improve your website SEO, I recommend Kate Toon’s free SEO Nibbles course. There are some wonderful paid keyword tools on the internet. But, if you have a small marketing budget you might need to use free keyword research methods. To get some ideas for your keywords, Google is a good place to start. There are two places on the google page that you can get keyword ideas. Google instant – When you type a search into Google search, you will notice that Google offer suggestions of what you might want to search for. These are based on what other people are searching so they can be a good insight into what is popular. Related searches – At the bottom of your Google search page you will see other searches related to the keywords you used in your search. These are valuable to find out what people are looking for and what things are related to your niche. Check out this video from Kyle from Wealthy Affiliate which explains keyword research. Another great free resource for getting keyword ideas is Answer the Public. This tool says it gets its data from Google and Bing. Simply pop in your keyword and it will produce a mind map of keyword and content ideas. It’s easy to use and you can even download the data into a spreadsheet to sort and save. Once you have some keyword ideas its time to sort out which one can work for you. There are two main features that you want a keyword to have for it to work for you. 1. It has to have people searching for it (usually called search volume). If there is no one (or very few people) searching for a keyword then it will not be directing any traffic to your site. 2. The competition for that keyword has to be low enough that your site will be able to rank. If a lot of sites are vying for the same keywords it reduces your likelihood of being seen on search results pages. Often well-established, high authority website will get the top positions. If your website is still new it is best to strive for low competition keywords to increase your likelihood of getting on that first page of search results and ultimately getting traffic to your site. When you search a keyword in this free keyword research tool powered by Jaaxy you will get results that look like the image below. You will notice that some of the keywords it suggests are not written in proper grammatical English. Don’t use these suggestions. Always use works and phrases that make sense and you can put in a sentence. 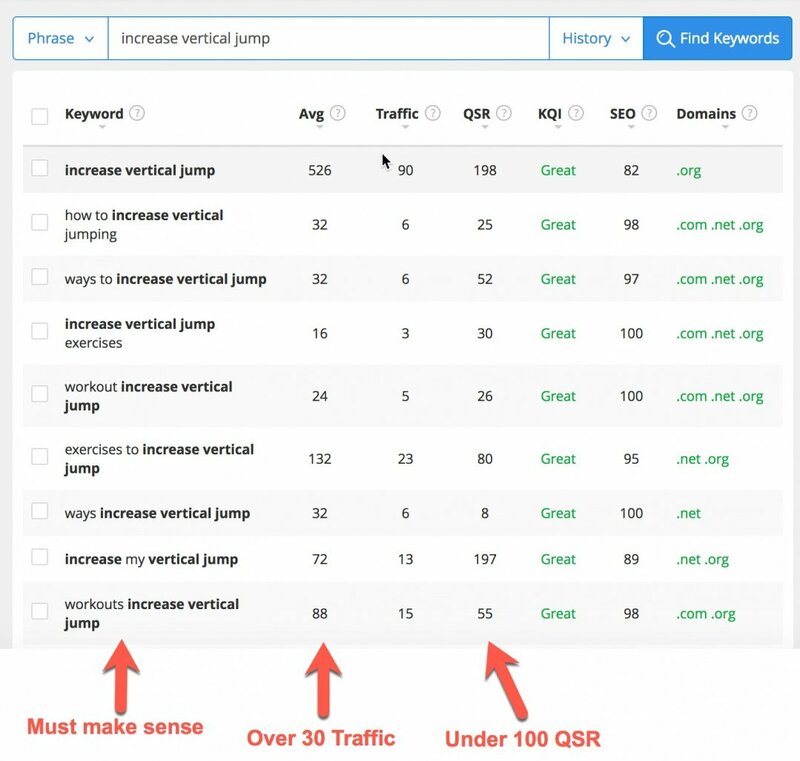 When looking at your keyword results the columns that are most important are the Avg and QSR columns. This will tell you the search volume and competition that is vital to finding killer keywords. This refers to the worldwide, monthly traffic that this keyword gets. If the search volume is under 30, it probably isn’t going to get enough traffic to your site to make it worthwhile. The higher the search volume, the more people you are going to be able to attract with your keyword. This abbreviation stands for Quoted Search Results. It is the number of search results that rank for this exact keyword. The QSR is essentially the competition for a particular keyword. In this case, the lower the number, the better. For new and younger websites aim for a QSR under 100. If your site is a bit more established you can aim for under 200. I hope you have found this little guide to how to find low competition keywords for free helpful. If you have any questions about keywords or Jaaxy, feel free to pop them in the comments below. Hi, very interesting article about finding low competition words. If you are able to have Jaaxy I think this the best solution, there you can really find whatever keyword you want. Your guide about searching and finding keywords is very informative and helpful, especially for beginners. Have you tried some other simmilar programs as Jaaxy? Thanks for sharing with us! Hi Luke, I have tried many keyword research and SEO tools. Some are good but also very expensive. I like Jaaxy because it has a valuable free version. I also like Keysearch because it is a lot cheaper than some of the others.